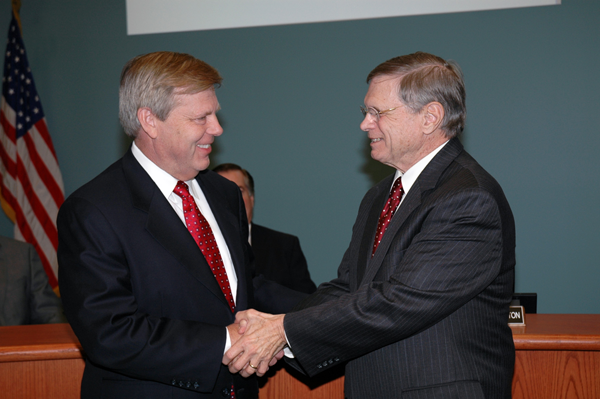 Jerry Prater (right), chair of the DCCCD board of trustees, welcomes Dr. Joe May as the district’s seventh chancellor following the trustees’ Dec. 3 meeting. (Dallas) — The Dallas County Community College District’s board of trustees unanimously approved the selection of DCCCD’s next chancellor, Dr. Joe May, during its regular monthly meeting today. May’s three-year contract specifies his annual salary – which is $300,000 – and solidifies his start date, Feb. 26, 2014. The DCCCD board of trustees conducted a national search for a new chancellor this year; its members comprised the executive search committee, and they announced their choice of the sole finalist in October. May is chancellor of the Louisiana Community and Technical College System. The district’s current chancellor, Dr. Wright Lassiter Jr., announced his retirement earlier this year, which prompted the national search. Board members also unanimously named Lassiter chancellor emeritus during the meeting; he will assume that title once May begins his tenure at DCCCD. As chancellor emeritus, Lassiter will serve as a consultant and assist the new chancellor when May transitions into the district and the Dallas community. Following the vote, May expressed his thanks to the trustees, praised the outstanding leadership that Lassiter provided for many years and discussed how important community colleges are to higher education, students and the workforce. For more information, contact Ann Hatch in the DCCCD office of public and governmental affairs by phone at (214) 378-1819 or by e-mail at ahatch@dcccd.edu.